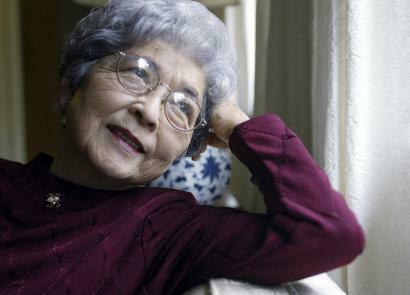 LOS ANGELES - Violet Kazue de Cristoforo, a California poet and scholar who wrote, collected, and translated haiku that compressed into a few lines the heartaches and realities of the detention camps where thousands of Japanese-Americans were incarcerated during World War II, died Oct. 3 at her home in Salinas, Calif. She was 90. Mrs. de Cristoforo died two weeks after returning from Washington, D.C., where she was honored by the National Endowment for the Arts with a National Heritage Fellowship Award for achievement in traditional and folk arts. The cause was complications from a stroke, said her daughter, Kimi. A native of Hawaii who grew up in Fresno, Calif., Mrs. de Cristoforo was one of 110,000 Japanese-Americans sent to 10 camps in seven states after the bombing of Pearl Harbor. Mrs. de Cristoforo, who ran a Japanese-language bookstore in Fresno with her husband, had two young children and was expecting a third at the time. She was still weak from an operation to remove a tumor when Executive Order 9066 was imposed Feb. 19, 1942, authorizing the military to remove any citizen from a broad swath of the West Coast who might be a threat to national security, mostly those of Japanese descent. By April 1942, she and her family were living in a tar-paper shack at the Fresno Assembly Center, formerly a horse track. She gave birth to her third child over an orange crate and two weeks later was on a dilapidated train with a sickly baby to a camp in Jerome, Ark. At Jerome, her husband, Shigeru Matsuda, and his parents decided that, because they had lost everything of value they had owned in Fresno, they would return to Japan, where they still held some property. When it came time to fill out a loyalty questionnaire, Mrs. de Cristoforo followed her husband's advice: "My husband had told me, 'Don't answer this. . . . Don't trust the government, don't trust anybody, just say you're seeking repatriation with my family.' And that is the only thing that I wrote. I did not answer yes or no to the questionnaire," she said in "And Justice For All," a 1999 oral history of Japanese-American internees by John Tateishi. From Jerome they were sent to the Tule Lake Relocation Center, a high-security camp built on old lava beds in Northern California, where Japanese internees who had refused to sign the loyalty oath were imprisoned. Her husband and her brother were arrested after joining a committee to investigate food shortages at the camp. Her brother was thrown into the stockade, while her husband was sent to a camp in Santa Fe. Mrs. de Cristoforo remained at Tule Lake for the duration of the war with her three small children, a sick mother-in-law, and a father-in-law who went mad with grief after his wife's death from cancer. Mrs. de Cristoforo, who had belonged to a haiku club in Fresno, wrote poems on whatever scraps of paper she could find. "Throughout, haiku helped hold me together," she told The Salinas Californian in 1993. "It was an escape, and it let me express my feelings." Mrs. de Cristoforo left Tule Lake with her children in 1946. Her husband had been repatriated to Japan first, and when she arrived in March of that year, she learned that he had remarried. Seeking reunion with her mother, she took a train to Hiroshima but found only the devastation from the atomic bomb dropped eight months earlier. When she finally found her mother, after walking two days through the mountains, the older woman "looked like a monster" with severe burns and barely any hair. Mrs. de Cristoforo returned to the United States in 1956 after marrying Wilfred H. de Cristoforo, a US Army officer stationed in Japan after the war. They moved to Monterey, Calif., where he attended the Army Language School and she went to work for the McGraw-Hill educational publishing company. He "is the one who really encouraged my mother to publish her work," her daughter Kimi said in an interview Monday. According to her daughter, Mrs. de Cristoforo spoke little of her wartime experiences except in her poems. Her books include "Poetic Reflections of the Tule Lake Internment Camp, 1944" (1987) and "May Sky: There Is Always Tomorrow" (1997), an anthology of free-form haiku, called kaiko, written in the camps. She was to read one of her poems at the ceremony in Washington. "She was so excited about it," her daughter said. "This trip to Washington, D.C., was the culmination for her." Already in poor health, Mrs. de Cristoforo was unable to recite the poem she had chosen for the occasion. It was read instead by Norman Mineta, the former congressman who as a boy was incarcerated at the Heart Mountain Relocation Center in Wyoming. A notation suggests the poem was written when prisoners in the Tule Lake stockade were on a hunger strike. Mrs. de Cristoforo's brother, who had been falsely accused of taking part in a food riot, was locked up for 10 months. The cruelest injustice came afterward, when Mrs. de Cristoforo struggled to make a living for herself and her children in Japan. She found a place to live outside Hiroshima and worked as an interpreter, but the economy was in ruins and Japanese-Americans were often not warmly received. When Mrs. de Cristoforo's oldest child, Ken, was 12, she begged friends in the United States to find him a home. Two years later, she sent her second child, Reiko, too. Bounced from one place to another, the children felt abandoned, and Mrs. de Cristoforo, as a noncitizen, was powerless to help. Mrs. de Cristoforo spoke frankly in her oral history of their rejection of her, but also tried to accentuate the positive, how she kept track of their lives, how well they turned out without her. "I've learned to realize there are so many things in life beyond your control," she told The Salinas Californian some years ago. "Rather than being bitter or angry over it, I began to think it was a mission in my life. . . . God gave me the gift to go and come back."